From Doc McStuffins to a Chrysler commercial, from Seinfeld to Star Trek to Odyssey, Andre and Phil share their journeys with us. Plus, hear a preview of "In a Sun-Scorched Land, Part 2." April 24, 2019: Ahoy! Sound designer Nathan Jones takes us beneath the seven seas in "B-TV: Trinity". April 10, 2019: Monica Padilla - voice of double "L" Jillian, double "L" Marshall - tells us about auditioning opposite Townsend Coleman, preparation for acting, and (yes) appearing on the TV show Survivor. March 27, 2019: Marshal Younger returns to the studio for the first time in over a decade. March 13, 2019: Meet the new actresses in "Between Camp and a Hard Place"
February 27, 2019: Hear about the challenges - and the true story - behind creating "In a Sun-Scorched Land" from the crew who created it. 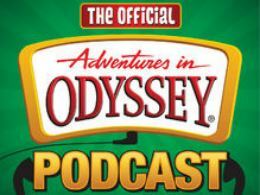 These digitally remastered collections - available for the first time on CD - include bonus tracks, fun facts, and behind-the-scenes details A fun-filled, full-color insert includes the following: original notes of the writers, never-before-heard stories from the recording studio, and a coupon for other Adventures in Odyssey products. This album's episodes will take you from the discovery of a hidden treasure chest to a hair-raising voyage in the Imagination Station.